The squawk is unmistakable, a harsh, high-pitched cry with undertones of bass, lasting about 2-seconds, followed by a second, then a third “Squaaawwwk.” It’s etched into my audio memory, which is quite a feat considering the problems I have recognizing even the most common bird cries. I look up and see three large green birds, the bright green contrasting with dark blue underwings, whitish-grayish foreheads and breasts shining in the winter sun, flying overhead. “We got them,” I say happily to the three members of my 2011 Christmas Bird Count team, strung out along the path traversing Powell’s Cove Park. 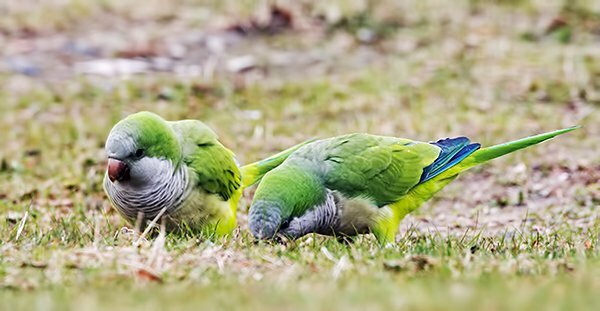 “The Monk Parakeets. We have them for the count!”. There is another area of the Queens County CBC where a team will also likely see Monk Parakeets, Myipsitta monachus, but I am seriously determined to count that bird for my area, Coastal Flushing, a section of northeast Queens, New York, that includes Whitestone, home of one of the loudest invasive bird species in the U.S. I have a lot of affection for Queen’s Monk Parakeets. I grew up in Whitestone, and though the birds were not around at that time, I love the fact that they decided to populate this particular area of New York City. The first CBC entry for Monk Parakeet in Queens was in 1989 (one bird! ), but there are reported sightings dating back to the early 1970’s. Not in Whitestone, that came later. According to a December 1970 article in the New York Times, there was a flock of 9 to 12 birds in Fort Tilden. Other areas of New York City where the parakeets were seen in 1970 included the upper East side of Manhattan, Great Kills, Staten Island, Ellis Island and the area around the Statue of Liberty. This is curious, because these are not areas where the parakeets thrive today. 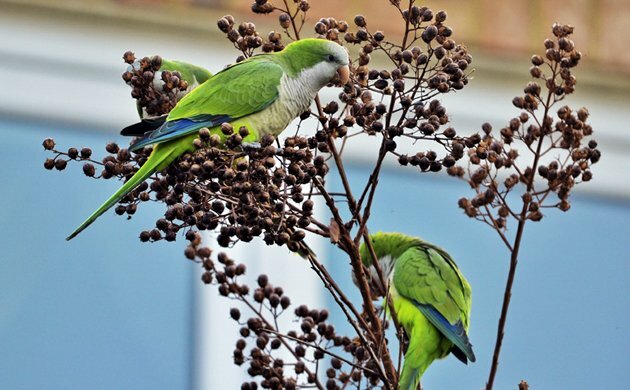 * NYC Monk Parakeet colonies can be found in Whitestone and Howard Beach, Queens; in Brooklyn, notably Greenwood Cemetery and Brooklyn College; and in the Bronx, notably Pelham Bay Park, where Mike saw them in 2005, and City Island. The question is why these natives of rural areas in southern South America (east of the Andes) have been so spectacularly successful in establishing their colonies. Monk Parakeets are established not only in New York City, but in at least seven states (Connecticut, Florida, Illinois, Louisiana, New Jersey, New York, Texas), Puerto Rico, the Bahamas, and Quebec, Canada in North America; Belgium, Italy, England, and Spain in Europe; cities in South America (where they are considered introduced since these are not rural areas), and possibly even Japan. There are a lot of pet psittacines out there that escape or are released. Not many survive, and very few flourish. The answer lies in the nests. Monk Parakeet is the only parrot species that builds its own nest. These are extremely large stick structures (some articles compare the largest ones to the size of a car) that are usually populated by multiple breeding pairs in separate chambers. Some articles speculate that the nests offer protection against the cold. 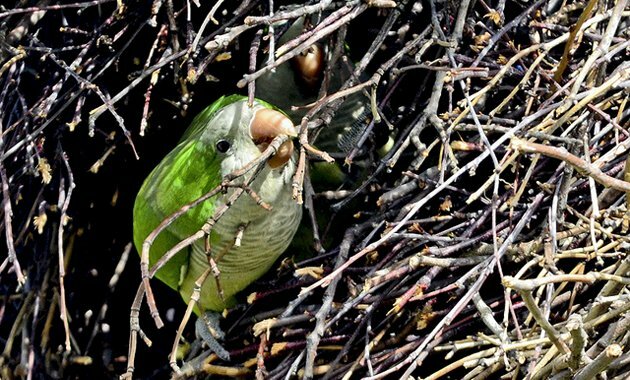 Stephen Pruett-Jones, an evolutionary biologist who has extensively studied the Monk Parakeets of Chicago, only says that the nests offer a successful alternative to the tree hollows or palm trees utilized by other parrot species. I say the nests work because these birds are not very fussy about where they build them. Speaking of Chicago, this is where I first encountered Monk Parakeets. 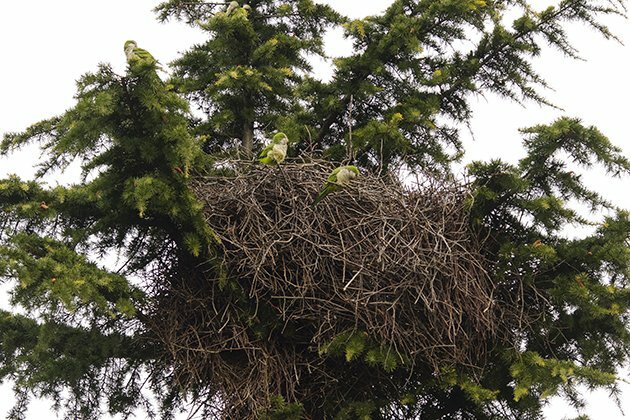 My daughter was taking an evolutionary biology course at the University of Chicago and was given an assignment involving surveying Monk Parakeet nests in Hyde Park. These surveys were regularly assigned to University of Chicago students and were part of the data used by Pruett-Jones and his colleagues. Of course, the only thing my daughter knew was that she had to go out in the cold and look at birds. Which were her mother’s passion. This was in my early birding days, however, and I was skeptical. Parakeets in frozen Chicago? Sounded crazy. So, I flew to Chicago, where my daughter directed me to Washington Park in New Hyde Park, the area of Chicago where the University is located. And, there I saw the famous Monk Parakeet nests saved by Mayor Harold Washington. The story goes that the mayor lived next to the park and adored the birds. After he died in 1987, the U.S. Department of Agriculture’s Animal Damage Control unit tried to remove them, sparking a fight with Mayor Washington’s neighbors, who also loved the parakeets, and the establishment of the Harold Washington Memorial Parrot Defense Fund. The people were successful, and the parakeets remained, at one point numbering in the hundreds. The nests were impressive, dominating the small green square. I didn’t hear the birds at first, but as my eyes got used to the sight of the sticks, I could see spots of green and blue moving in and out of them. It was winter. It was cold, no, freezing. What were all these birds living on? Which brings us to the second reason Monk Parakeets survive so well in urban areas (and seemingly anywhere): their flexible eating habits. Their usual diet consists of berries, acorns, leaves, fruit, buds, etc. But, when these are not available in winter months, they will eat seed and grain. Again, not very fussy! They are commonly seen at backyard bird feeders in Chicago, according to Pruett-Jones, eating till the feeders are empty. This echoes their behavior in their native South America, where they are known as agricultural pests who will eat and destroy crops. In the 1970’s, they were responsible for the destruction of up to 45% of certain crops. ** The initial impetus for Pruett-Jones’ studies was to find out if the Chicago Monk Parakeets posed a threat to Illinois farmers. 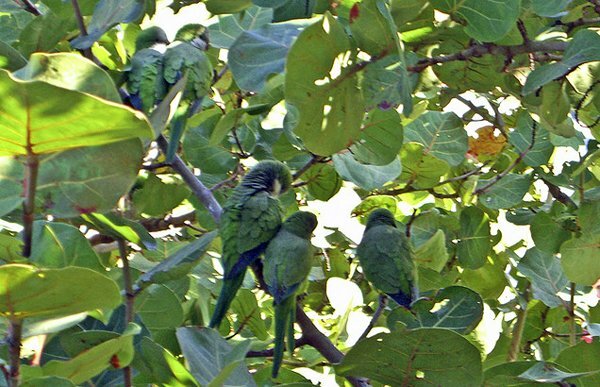 Even today, newspaper and magazine articles about the parakeets have headlines like this one, that ran in the Broward (FL) Sun-Sentinel on March 2, 2014: Monk Parakeets: Delightful Import or Pest? * Devlin, John C. A South American Bird is found thriving here. New York Times, Dec. 16, 1970, p.51. ProQuest Historical Newspapers, viewed July 17, 2014. Thanks to Stephen Baldwin, who found this article and wrote about it in his blog BrooklynParrots in the article Day of the Monk Parakeet: December 16, 1970, http://www.brooklynparrots.com/2013/08/day-of-monk-parakeet-december-16-1970.html. ** Johnson, Steve A. and Sam Logue. Florida’s Introduced Birds: Monk Parakeet (Myiopsitta monachus). Document WEC257 of the Department of Wildlife Ecology and Conservation, University of Florida / IFAS, http://edis.ifas.ufl.edu/uw302. The Monk Parakeets in my neighborhood have their own Facebook page! I’ve had them at my feeders a couple times, but they don’t stay long. 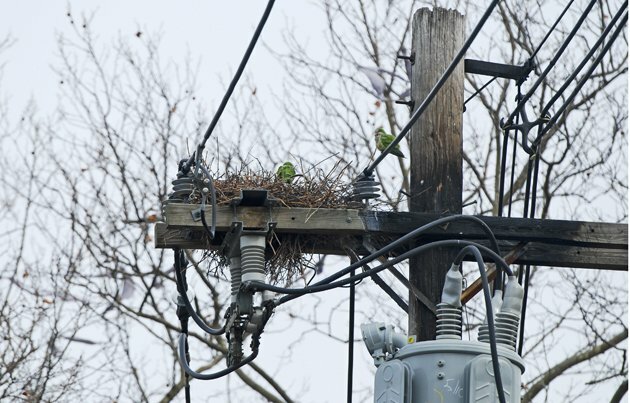 I see their nests in the utility poles a couple miles from my house in southwest Dallas. Thanks for a fascinating post. Great photos, too! That’s a great Facebook page, Linda! And, I like the fact that people are contributing links to studies and data as well as photos. Thanks, Wendy! I love photographing my Whitestone Monk Parakeets. There is also one photo there from Florida. It would be fun to photograph Monk Parakeets in as many states as possible. Donna – lots of great information here! Several years ago, when my wife and I lived in the Hartford area, we would make trips down to the coast to see shorebirds at Milford Point and hunt down Monk Parakeet nests. Fast-forward to this year, when we put up a nice Wild Birds Unlimited feeder system in the back yard of the house we bought last year in West Haven. After a few months of getting the usual assortment of sparrows, doves, and finches, one day in early August, we suddenly had Monk Parakeets at our feeders, up to eight at a time, from morning to late afternoon. This has continued until the last few days, when they have (sadly) become much less frequent visitors (only one, briefly, yesterday), for unknown reasons. We’re not even hearing them in the area like we had been – perhaps they have discovered another food source somewhere? Needless to say, we’re hoping this is a temporary lull – they add a lot of color to our backyard feeder, and it was nice having birds that we used to drive 90 minutes to see coming to us! The Marvelous Spatuletail on Display!